★. 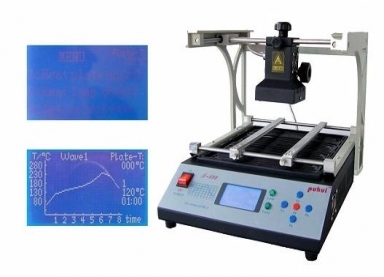 (1) This machine has the strong and perfect function selection, with eight temperature waves in the memory software, you can select the right temperature wave according to the solder/unsolder request. ★. (2) Intelligent temperature wave heating, can achieve the solder/unsolder automatically. ★. (3) Three-dimensional adjustable lamp body, use laser light, suitable for unsoldering any-angle components. ★. (4) PID intelligent temperature control can avoid the IC damage due to the fast or uninterrupted warming up. ★. (5) This machine has a super hot melt system, use infrared welding technology which is developed independently, heat is easy to pierce and distribute evenly, can suit for a variety of computer, notebook, play station’s BGA components, especially in a Northbridge/ Southbridge chipset of computer. ★. (6) Friendly human-machine operation interface, perfect LCD display, you can watch the whole repairing process very clearly. ★. (7) Ergonomic design, practical and easily operated. Good build quality but at the same time light weight and a small footprint allows the T-890 to be easily bench positioned, transported or stored.